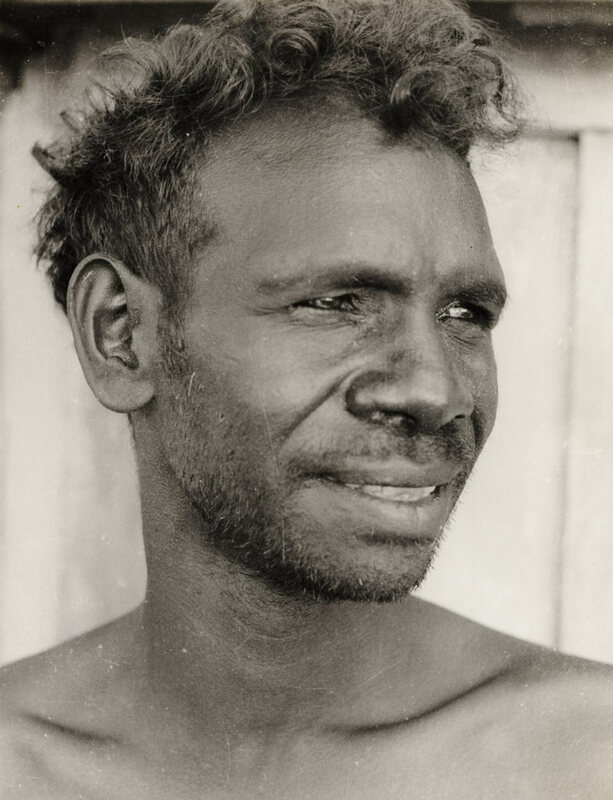 Sam Djimbarrdjimbarrwuy Garawirrtja was among the youngest artists working at the small island of community of Milingimbi in Arnhem Land during the 1950s, with his work showing an exceptional level of artistic expertise and refinement for his age. His paintings are not widely known and until recently those in the collection of the Art Gallery of NSW were recorded as being by ‘Lipundja I’. This confusion arose from the fact that Djimbarrdjimbarrwuy was previously known as Lipundja II. His name was altered to Djimbarrdjimbarrwuy following the death of Lipundja I in 1968, yet the collection records had not been adjusted to reflect this, and all works by both artists were simply assigned to ‘Lipundja’. Djimbarrdjimbarrwuy’s father was a Gupapuyngu Birrkili man named Dhimala, who is recorded in anthropologist Donald Thomson’s photographs from the 1930s. Andrew Birrinydjawuy was one of his brothers. Djimbarrdjimbarrwuy worked with Yirritja artists Johnny Dayngangan, Billy Djoma, Tony Djukululu, Tony Yuwati, Jimmy Mamalunhawuy and Jimmy Wululu on the Milingimbi Easter panel c1965, now in the collection of the National Gallery of Australia. This dramatic work was prepared as a backdrop to an Easter pageant in the community at the Methodist Church and depicts in graphic form the main protagonists and events of the crucifixion and resurrection of Christ. 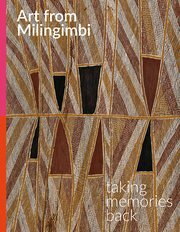 It is a fine example of the merging of Christian and Yolngu systems and values that were supported by the various missionaries who spent time in Milingimbi, allowing for the development of the dynamic art movement of which Djimbarrdjimbarrwuy was a part. In the elegant bark painting Mundukul 1961 Djimbarrdjimbarrwuy gives precise form to five Yirritja snakes. Sinuous and poised on the points of their tails, they reach for the sky in an attempt to pierce the storm clouds causing torrential rains to fall. Mundukul is shared by a number of clans of both moieties, with people being wary of angering it for fear of any retribution it may enact, such as spitting lightning, unleashing destructive storms or even swallowing people whole. The pared-back ground onto which the simple forms of the snakes are depicted in this work is in stark contrast to Djimbarrdjimbarrwuy’s Bulukminy (file snakes) near Buckingham Bay from the 1950s. Alive with detail, this work is associated with the Wägilak sisters. One snake is clearly evident in deep black on the right of the work, while another is embedded within the vertical design, its adorned skin camouflaging it within the field of dots to its right. Trails of eggs alternate with the snakes, their cross-hatched forms rendered in the same format but in the opposite direction to the cross-hatching employed on the edges of the work. Creating a sense of tension and movement, this dynamism is intensified by the brilliant dotted fields set against bands of pure colour in the central section; the resulting effect is one of flickering luminosity. Djimbarrdjimbarrwuy also gives brilliant form to the conditions found at particular places in country at certain times of the day. In Oysters growing on rocks at Guruwana c1960 he depicts an important location on the mainland near Elcho Island, where oysters are found. The central form in the work alludes to a rock formation under the water, to which dead, broken, empty and full oyster shells are attached, their various states indicated by the differing colours and infill techniques. This tidal country is surrounded by mud, as indicated by the yellow bands that run horizontally across the work. In the related work Guruwana – a sacred place c1959, Djimbarrdjimbarrwuy provides the additional element of a band of cross-hatching within the segment of mud to indicate the presence of rocks that are covered and uncovered by saltwater as the tides rise and fall.